Discover two of Toronto's most colorful and multicultural neighborhoods on this small-group walking tour of Kensington Market and Chinatown. On this 2-hour tour, immerse yourself in both local and international culture as you wander the often bustling streets lined with unique vendors and specialty stores. Learn from your guide about the history of these areas and discover the best places to shop and eat. 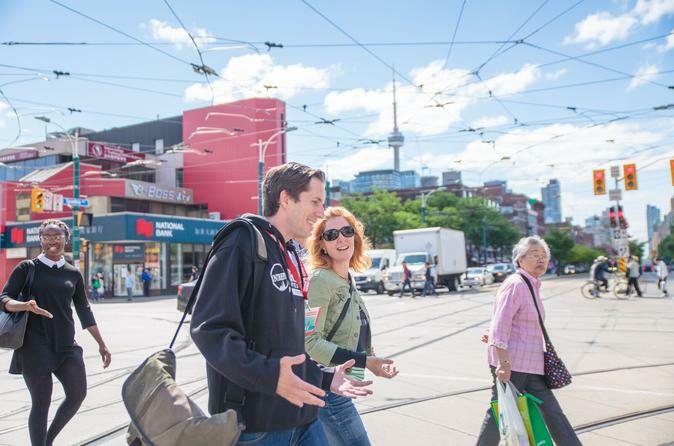 Explore the streets of Toronto and discover the multicultural neighborhoods of Kensington Market and Chinatown on this 2-hour small-group walking tour. Starting your tour outside the Art Gallery of Ontario (AGO), pass regal Victorian and Georgian mansions and enter Chinatown. A feast for the senses, this neighborhood boasts many restaurants and shops brimming with authentic Chinese products and goods. Learn how Chinatown has evolved from a working-class Jewish market into a working-class bohemian market and one of Canada's largest Chinese communities. Then, head just one street over to Kensington Market, the origin of multicultural Toronto. Explore its fruit and vegetable markets mixed with cool cafés, restaurants and vintage clothing stores – there’s neither a Starbucks nor a McDonald’s in sight! As you walk with your guide, learn how several waves of immigration over the past 100 years have splashed colors, sounds and flavors from all around the world throughout Kensington Market. Admire the brick walls covered with stunning graffiti murals and street art. Along the way, your professional local guide will add interesting commentary and cover the history of these communities, as well as point out the best places to eat and shop.